The video is complete, and the band LOVE IT! If you haven’t already, watch the video blog above and marvel at how a few extras can be encouraged to go crazy and end looking like a huge crowd – I am amazed myself that we pulled this one off! This was so much fun to do and a complete aerobic workout as a bonus. Already the video has led to a number of exciting new opportunities… watch this space. 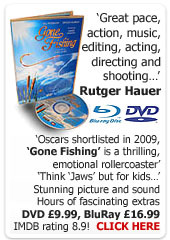 But… I cannot allow this to get in the way of the bid for the Oscars, so now it’s done and dusted, it’s back to 'Gone Fishing' and full steam ahead! Blimey, Leah is REALLY tall! Over the last week or so I have been producing a music promo for an emerging band called The Silence Within. They are from the Kerrang school of music, so think NuMetal, Linkin Park etc. They are also a good looking bunch of lads, so we have high hopes for them on Kerrang and Scuzz channels. Pic by Denise Gabriel. The song we chose is very catchy, and you can listen to it here on their MySpace page. Over the next few days we will post a link to the video, but we are also making a video diary of the ‘Behind The Scenes’ which I will also post. We shot the video on stage 1 at Ealing studios, and it included a six foot female Terminatrix in leather, a huge audience, ear splitting PA’s and of course, lots of smoke… Nice! I have received a huge amount of emails from people saying how much they enjoyed the film. I have also had requests about the music, some of you want to know how to hear it again. So I have made up a short edit of the music tracks, which runs for about 15 minutes, and includes the complete music cues from the film. It is saved as a high bitrate MP3 and you can play it on your computer, convert it to a CD or load into iTunes or your MP3 player. You can save it by right clicking here and saving to your desktop. Or just click to play it. 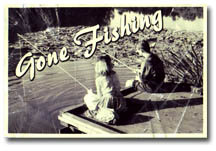 This link will only be live for a week or so and is only available to cast, crew and associate producers for ‘Gone Fishing’. I hope you enjoy it and that it brings back memories of the day. I have been working on music (STILL I KNOW! )for the last few days and have come to believe that in order to get the immense and epic battle music I need, I am going to have to use some library or production music. This seems to me to be the only way to get that huge orchestra sound without actually hiring an orchestra. Yes I know synthesisers and samplers are good now, but even when they are at their best, I can still hear that it is electronic and not human. And in this climactic battle between boy and pike, I need something that goes the extra mile. 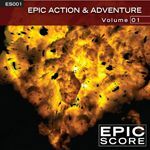 After trawling around, I finally found Boosey Tracks, and an album called Epic Action and Adventure Vol 1 – I think I am going to look into using the track called THE TIME HAS COME (A). Check it out. It’s certainly epic! 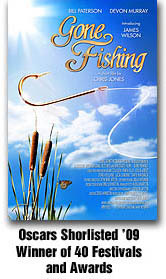 We are now adding music to Gone Fishing, and for part of the score, I am using music pulled from one of the unique music libraries here in the UK – Audio Network has thousands of tracks that you can use in your production, for a one off fee of £250 – all rights, worldwide. If you plan to sell on DVD a further £100 is payable, making a total of £350 – EVERYTHING CLEARENED ALL RIGHTS! That’s not per track either, that’s the whole show, be it a TV drama, commercial or feature film. This represents EXCELLENT value for money. We have selected a number of tracks which we will be putting into the cut tonight – you can preview one of theme here. If you are interested more in Audio Networks, you can check out there site here. 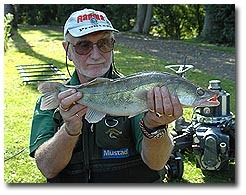 I have been looking for music for Gone Fishing and right now we are trying to get a track by Philip Glass. However, one of the people who has contributed to the budget is also a composer and he has written some music for the film just off his own back, having had a brief email chat with me – and you know, he isn’t too far off the mark. We are not going to use this as is, but it’s a possible step in the right direction, and I thought you might be interested in hearing it. 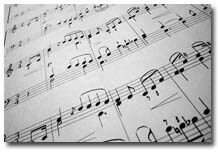 The composer is Philip Martin. Who knows, Philip may end up doing the score. Right now he is actually at the top of the list, ahead of Philip Glass (though we do hope Mr Glass will respond, in which case he will of course slip to the top of the list immediately). Philip is living proof of one of my main life philosophies in that taking action always creates results.